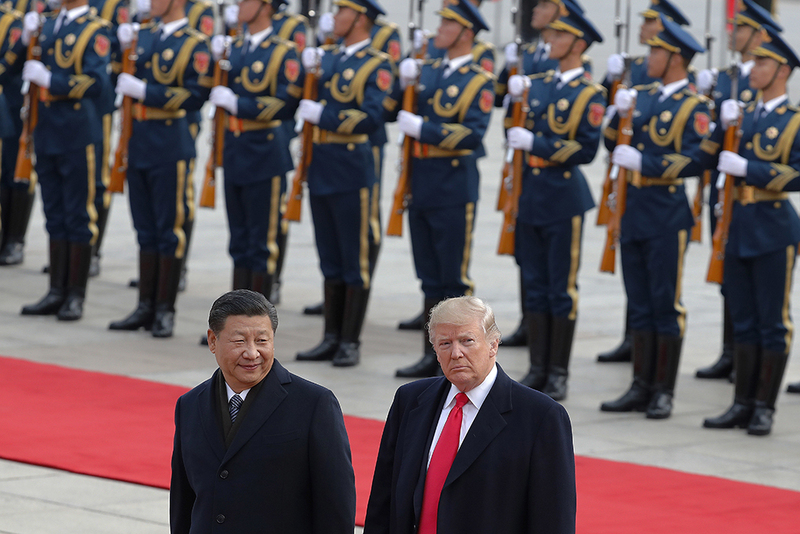 U.S. President Donald Trump, right, walks with Chinese President Xi Jinping during a welcome ceremony at the Great Hall of the People in Beijing, November 9, 2017. This, of course, was hyperbole. But since then, a much more complicated reality has been playing out. As President Trump has withdrawn or damaged U.S. leadership around the world, China has seized opportunities—from Asia to Europe to the Middle East—to advance its own interests. So far, in many of these cases, China’s actions are undermining the interests of the United States and Europe, along with aspects of the global system of rules and norms that the United States and Europe believe should not change—such as respect for human rights and the peaceful resolutions of disputes—even if China wishes to transform them. More generally, while China’s rise will naturally shape the global system, the questions that the United States and Europe must be focused on are how China is using its newfound influence and whether that influence might undermine U.S. and European interests. As the United States and Europe increasingly look inward, the trans-Atlantic allies must remember that they have strong shared interests in continuing to advocate for rules-based, peaceful approaches to global challenges and in working together to push back against damaging Chinese influence where necessary. The United States and Europe share long-standing interests in international rules and norms that benefit everyone. From respecting human rights to abiding by global trade norms to peacefully resolving disputes, Europe and the United States have helped craft and uphold norms through diplomacy and the construction of international institutions that support peace and prosperity. As China rises, it often acts in ways that could undermine these international norms, including its disrespect of human rights at home and abroad, its assertiveness in dealing with maritime disputes, or its disregard for certain economic and trade rules. The potential for China to undermine these norms is one of the major concerns that the United States and Europe share about China’s growing influence around the world. Over the past year, the United States and Europe have not been helping themselves. In less than a year in office, the Trump administration has gone on a rampage of withdrawing the United States from key positions of leadership around the world, from the Trans-Pacific Partnership (TPP) trade deal to the Paris climate agreement to the Iran nuclear deal to the United Nations Educational, Scientific and Cultural Organization (UNESCO). With its sights set on tearing down U.S. commitments abroad and few senior policymakers appointed in the departments of State or Defense,3 the Trump administration is ceding American capacity to shape outcomes, while ignoring major global political shifts taking place. At the same time, Europe is trying to manage a newly unreliable U.S. government while focusing on major internal crises, including Brexit, immigration, slow economic growth, and the rise of populist right-wing parties. While the European Union’s institutions and member states have devoted quite a bit of attention to China in recent years, it has been too little. These seemingly intractable internal issues are preventing the European Union and individual European states from pursuing a more ambitious and coordinated international agenda. Even with a smaller U.S. role in the world, fears that China will somehow take over the U.S. position as a global leader are unlikely to manifest in full anytime soon. Despite the new ambition shown in President Xi’s report to the 19th Communist Party Congress, it is not clear that China wants the global responsibilities of the United States. Even if it did, China does not yet have the capacity to meet these responsibilities, and its rising influence and power raises concerns in many parts of the world. In the absence of a focused United States and European Union, China is finding ways to quietly advance its interests in Asia, Europe, and the Middle East. In some instances—such as some forms of economic investment and contributions to peacekeeping—a greater Chinese role can be welcome. In these and many other arenas, however, China’s growing clout could itself undermine U.S. and European interests, in addition to giving China leverage with which to harm these interests directly, should the nation choose to wield it accordingly. With political chaos in the United States and Europe, opportunities for China and receptivity to more Chinese involvement around the world are slowly expanding and, with them, vulnerability to Chinese pressure. Further, Trump’s criticism of allies has also damaged U.S. credibility in Asia, making U.S. allies and partners nervous and fueling conversations in capitals across Asia about whether countries need to adjust their regional policies accordingly. In Australia, a veteran journalist said that Trump’s foreign policy decisions had “pressed fast-forward on the decline of the United States.”6 One South Korean publisher wrote an op-ed in The New York Times stating that “it now looks like America could bring our doom.”7 Japanese foreign policy commentator Yoichi Funabashi said, “The U.S. withdrawal from T.P.P. was the biggest shock to the alliance since Nixon went to China.”8 The list goes on. As the closest partners of the United States in this region increasingly view the United States as untrustworthy and unreliable, hedging their bets and decreasing the weight they give to U.S. preferences in their own decision-making are the logical next steps if these trends continue. And in Asia today, that means also thinking through any necessary accommodations to Beijing as its power grows. In the meantime, the region’s long-held fears of a distracted United States and rising Chinese influence are quietly coming true. The U.S. withdrawal from the TPP has shifted the region’s economic attention to the Regional Comprehensive Economic Partnership (RCEP) and a TPP-11 deal, neither of which includes the United States.9 The United States will be unable to influence the content of either of these agreements, missing out both on the potential benefits of increased access to these markets and on the opportunity to mitigate the negative side effects of trade and their potentially negative effects on the U.S. economy and on vulnerable societies in the region. While the Trump administration criticizes the U.S.-Korea Free Trade Agreement and focuses on addressing bilateral trade deficits, the rest of Asia is moving ahead to write the rules of regional trade and gain advantages in the world’s second-largest economy. China—as the region’s largest economy and with growing economic ties with its neighbors10—is the biggest beneficiary of the lack of a U.S. economic strategy in Asia because it can eat up larger shares of markets in the region, while undermining principles such as upholding labor rights and environmental protections that the United States often pushes in economic engagement abroad. Likewise, the Trump administration’s unclear approach to countering Chinese maritime aggression is allowing China to capitalize by quietly bullying neighbors. When the United States and Europe fail to stand up for rules-based dispute resolution, China—and other powerful states that tend to behave similarly—can secure narrow benefits for themselves while harming the interests of smaller countries and the international norms that help prevent disputes from escalating into conflict. China’s neighbors are also much more worried as China’s assertiveness is meeting less U.S. resistance. In one case this summer, for instance, Vietnam gave in to Chinese pressure over Vietnamese oil drilling that irked China, supposedly because Hanoi realized that the United States would not push back against Beijing.13 Without the United States battling on behalf of international norms in the South China Sea, China’s divide and conquer strategy is increasingly successful in bullying individual Southeast Asian countries that cannot push back without U.S. support, and by dividing the ability of the Association of Southeast Asian Nations to unify in response to China’s assertiveness. Likewise, in the East China Sea, reports indicate another spike in Chinese exploration for gas—along with Chinese vessels—in disputed waters in 2017.14 A rise in activity in the East China Sea could spike tensions with U.S. ally Japan, as happened in 2012 and 2013,15 and once again pull the United States into the dispute on behalf of its allies. China’s influence in Asia has been rising for years, but without a coherent U.S. or European strategy to work with China where possible and push back against China when necessary, the Trump administration and the European Union are allowing regional challenges to fester. Trump’s myopic focus on North Korea and trade in Asia is blinding the U.S. administration to the broader changes taking place in Asia and to the moves that China is making that could harm U.S. interests. While economic investment in general is positive, these growing ties have sparked a debate in Europe about the economic and political consequences of China’s inroads into the region. There are concerns regarding the Chinese state’s involvement in investment deals and the long-term risks of China taking over key industries. And many policymakers in Europe are also worried about Beijing establishing a strategic foothold in countries that are either members of the European Union or are in line to join in the coming years, which may translate into Chinese influence over local governments and political systems. However, member states’ lack of a unified view on these issues has so far prevented the European Union from adopting a coordinated, strategic response to Chinese investment and influence in the region. There are proposals on how to respond on the table in Brussels, but a finalized policy is still some time away. In the meantime, China will continue to expand its influence in Europe, which will have serious consequences for European unity. A case in point is the June veto by Greece of an EU statement on China’s human rights record at the U.N. Human Rights Council. Greece exercised it veto shortly after the announcement of billions of euros’ worth of new investment deals between Greece and Chinese companies during the May 2017 Belt and Road Forum.21 This case not only shows Beijing’s influence over European member states but also Washington’s relative indifference toward these issues at a time when its leadership is sorely needed. Some European officials revealed after the vote at the United Nations that on past occasions, they were able to count on the United States to weigh in with Athens or other dissenting capitals, but the support did not materialize this time. Already, some of the Trump administration’s policy decisions are playing right into Beijing’s hands by pushing Europe closer to China: America’s intention to withdraw from the Paris climate agreement and actions to undermine the Iran deal, for example, have created a perception in Europe of a closer alignment with Beijing on these critical issues. And the lack of trans-Atlantic unity on issues related to values and global governance will leave Europe exposed to increased Chinese pressure, especially those European member states that have strong economic ties to China. Capitalizing on European and U.S. distraction, Beijing will continue to move into Europe, potentially harming European and U.S. interests—such as positions on human rights and control over strategic industries—in the process. Closer economic ties also come hand in hand with a growing diplomatic and security presence, as the government now has a stake in preserving security and stability in the region to secure Chinese citizens and assets and protect trade routes linked to the Belt and Road Initiative. Traditionally, China benefited from the relative stability and shipping route protection that the United States provided in the region. Now, with Washington’s gaze turned inward, China sees an opportunity to play a bigger role in the Middle East. China’s growing interest in peace and economic development in a region as plagued by conflict and poverty as the Middle East could turn out to be a positive development. And if China were to solve the Israeli-Palestinian conflict or bring an end to the war in Syria, the world would be forever grateful. The question is whether the ways in which China uses its influence, and the goals it seeks, are consistent with U.S. and European interests. And the evidence to date about what China prioritizes in its foreign policy does not indicate that China would support the same outcomes as the United States and Europe. China supports stability at all costs—and in the Middle East, that means ignoring human rights, support for terrorism, and hostility toward Israel and the United States. For example, China has been supportive of Bashar al-Assad remaining in power in Syria, which is a view contrary to the interests of the United States, Europe, and the region.30 And on Iran, China only became grudgingly helpful once it was threatened with massive secondary sanctions that would have severely damaged China’s economy. China is still far from replacing the United States as the main power in the Middle East. However, change is underway, and China’s influence in the region is growing rapidly. Many parties in the region—including authoritarian regimes—see in China a country willing to invest and mediate without pushing a foreign ideology or political system. They see an important trading partner and one of the world’s largest markets. And most importantly, they see an alternative to the distracted United States or Europe. Focused on their own domestic concerns and a small number of high-profile international crises, Europe and the United States are losing sight of strategic changes—including a growing Chinese role—that are taking place in the Middle East. If the United States and Europe are engaged in the right ways, there is the potential to shape China’s influence in the region in a positive direction. But if the United States and Europe are distracted or not focused on the right concerns, China’s inroads in the region could do substantial harm to Washington’s and Brussels’ interests in the future. The question is what kind of role China will play. China can certainly play constructive roles on a variety of issues. But China has increasingly proven capable of using —and willing to use—its growing influence around the world in ways that can undermine U.S. and European interests. The best way to prevent that negative influence is to work with China on key areas of concern, while also ensuring that the United States and Europe continue working together around the world to uphold shared interests. The United States and Europe need a serious strategic conversation about the consequences of present trends and to plan specific actions that the allies can take to ensure that China’s rise does not undermine the shared interests that the United States and Europe have in certain global rules and norms. But when the United States and Europe are distracted and unable to play a proactive role in protecting their interests from Asia to the Middle East and beyond, the harmful aspects of growing Chinese power and influence can erode shared interests. Furthermore, serious strains in the trans-Atlantic alliance under President Trump—from Trump endorsing a losing candidate in the French election to criticizing European allies—hinder the ability of these traditional allies to work cooperatively on anything. The shifts taking place around the world are significant, and lasting. With China’s growing reach, it’s unclear whether the United States and Europe will be able to make up lost ground when and if they are once again able to adopt robust, focused foreign policies. Helena Legarda is a research associate with the Foreign Relations and International Security program at the Mercator Institute for China Studies. Michael Fuchs is a senior fellow at the Center for American Progress. The Mercator Institute for China Studies (MERICS). Established in 2013, MERICS is a Berlin-based institute for contemporary and practical research on China that Stiftung Mercator set up as a platform for engagement with China in Germany. MERICS provides timely information and analysis on China to political and economic decision-makers as well as the media and the general public. MERICS has grown into one of the largest international think tanks for policy-oriented research into and knowledge of contemporary China. Independent and practical research. The ascent of China as a key global player has led to a wide-ranging shift in international power, market, and communication structures. This also has consequences for Germany and Europe. MERICS analyzes the political, economic, social, technological, and ecological developments in China, and their corresponding global impact. Through its research work, the institute plays an active role in the public debate on China and in shaping Germany’s relations with the PRC by providing new points of view and suggestions for decision-makers. MERICS enables people to see China from various angles and contributes to the level of expert knowledge on China available in Europe.